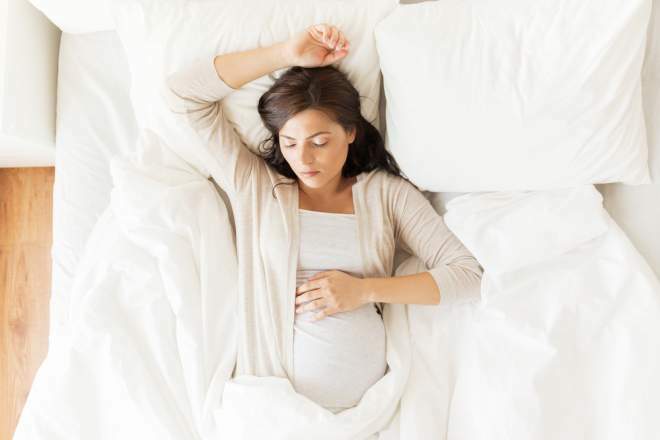 Getting a great night’s sleep while expecting a baby is often easier said than done! Whether you are a back or side sleeper, the position you previously found perfectly comfortable may now have to change. As your pregnancy progresses and the size of your bump increases, it is likely to be far more difficult to find a spot that works for you. What sleeping position is advised? Sleeping on your side with your legs bent is recommended as the most beneficial sleeping position for both you and your baby. This will take away the pressure of the baby’s weight from your uterus, therefore allowing the blood to flow making your heart’s job far easier. Your kidneys will also benefit, as being on your side will help eliminate fluids from your body, which will in turn reduce swelling in your ankles, feet, and hands. What sleeping position should be avoided? While pregnant, sleeping on your back should be avoided if possible as it makes it increasingly difficult for your blood flow to pass round your body. This can lead to you feeling lightheaded and dizzy plus has the ability to interfere with delivery of the things your baby needs to grow. The sheer weight of your bump, along with the laxity in your joints increasing as your body prepares for birth can unfortunately result in strong aches and pains. Try using a pillow between your legs for added comfort and reduce backache during the night. A specialised pregnancy pillow could be useful to solve this issue or a folded throw or small cushion placed in the small of your back works well to improve your sleeping posture too. Although, before you invest in a costly pregnancy pillow it is worth trying out other strategies first as you may find a further purchase isn’t required. It may be useful to get used to sleeping on your side early on in the first trimester your pregnancy, as it will make things easier as your due date draws closer. If you struggle from shortness of breath during your pregnancy, try propping yourself up into an incline with a few pillows under your head and back. This will increase airflow allowing you to breathe easier. Sleeping at a forty-five degree tilt can prevent a lot of the compression. Additionally, heartburn symptoms while you are in bed will be reduced by this technique. Pillows are also a good way to help you experiment until you find a comfortable position for you and eliminate the constant tossing and turning. Place a pillow behind your back to act as a barrier to prevent you from moving onto your back while you are asleep as this is likely to be a far more uncomfortable position. Although Mums-to-be are advised to sleep on their side, do not panic if you roll onto your back during the night this is completely normal. Waking up in a completely different position to when you fell asleep is not uncommon. After all, you will be aware that once your little one arrives sleep may be a thing of the past so it is essential you make the most of every hour during pregnancy!